It's time to vote! Operation Write Home is now in the finalists round in the JoAnns Craft for a Cause contest. We need to win this one for our heroes! Voting is open NOW - November 7 at midnight, and ending December 4th. There's only one vote per email per day - and we need you all to vote daily. My husband has been on his this deployment in Iraq since October of 2009 (Army and his 4th deployment). He is due home in Feb 2011. He has been writing home a lot on the Operation Write Home cards and for this, I thank you! We have 6 young children and they LOVE receiving these special hand made cards! It is such a wonderful way for the children to know that Daddy is thinking of them, and it encourages the children to write back! AWESOME! Please keep this program going, it is a huge success and morale builder! 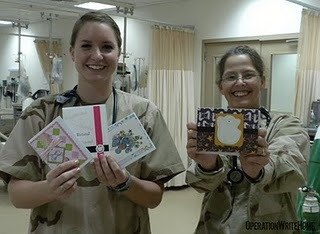 OWH Heroes enjoy our handmade cards. 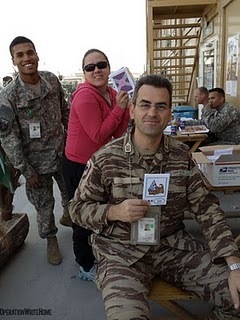 Thanks for support our troops!